Pilgrim: per through; ager land: peregrinus – one who walks through land, from far away lands, a stranger. Like lines from Yeats, there are things conspicuously from another century in the photographic works of Lisa Elmaleh. In “The Tower,” with his interest in images, memories, ruins, trees – at first glance he could be Wordsworth one hundred years earlier. But Yeats had lived through the turn of centuries, the First World War, and could not look at ruins and nature to ask questions of perception and sentiment as the Romantics had. It was no longer a question of the “half-perceived nature” at Tintern Abbey in 1789; for Yeats it had become a question of seeing at all: “Images and memories…I would ask a question of them all.” With metaphors and references to blindness as an inevitable, constituent element of seeing, Yeats brings us to this distinctly Modern alienation, springing from the Romantics, taking us along with him into a cold dark night from which he and we can look back but only forward with doubt. 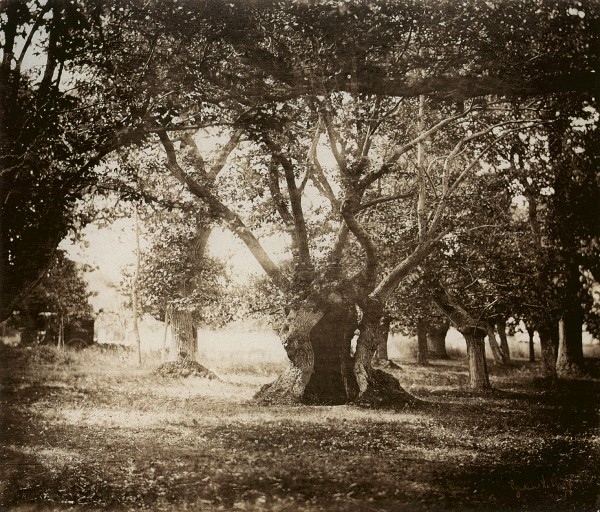 Elmaleh unmistakably references her photographic antecedents, those early experimenters with the medium, like Gustave Le Gray whose 1855 Hollow Oak Tree is one of the first images made from a collodion-on-glass negative. The foreground is blurred as is the background with a wooden cart of chemicals Le Gray needed to immediately develop and fix his images before they dispersed out of sight. The hollow oak tree, centered in the image, is crisp and present with the lines of its bark differentiated, etched by the play of light upon the suspended silver, as present as the dark dark hollow of its split trunk. Light, definition, and darkness are what play and display most in this new medium, a delicate and elaborate combination of glass, collodion, potassium iodide and silver nitrate. Stubbornly, willfully, especially in this age of the immediacy of imaging and communication, Elmaleh returns in her ongoing series Rooted to the potential in the collodion process, not the potential for a “better” image, but the possibilities within heaviness and slow-time. By comparison, Le Gray’s images are clean and neat. He is forging a new technology with his camera, developing and printing process, while Elmaleh reaches back technologically, composing images that open as much into the photograph as into the land. She is not looking back in nostalgia, rather she is wading through this medium, taking on its cumbersome requirements of a field camera, glass plates and an onsite darkroom. She invites the possibility of the unexpected in the edges of her images where the developer missed, dark splotches, ghostly swirls of chemical miscalculation, and all the time focused on land and especially trees with their thin branches etched and echoed into silver. Unlike Le Grey’s majestic oak, her trees are left to weeds and enveloping Kudzu that point to things forgotten or left unseen along the roadside. In Elmaleh’s work the surface of the image and the landscape bend and meld to a point of breaking through or breaking out of one another into a radical interiority. In front of trees, branches, a mass of rock, like Yeats, Elmaleh would “ask a question of them all.” Not a question of which image or which memory, but a question of what has become of images or memories. Looking at Elmaleh’s series Rooted, feeling the presence of her moving from place to place, imagining the weight of her camera and box of chemicals, there is a space opened up for reflection on where she has come from and where she is going through the land and within representation. The generosity of Elmaleh, like Yeats, is that she brings us along with her.